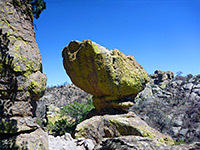 The best scenery in Chiricahua National Monument, with the most extensive outcrops of the eroded volcanic pinnacles for which the area is famous, is beyond the end of the scenic drive, near the crest of this section of the Chiricahua Mountains. Two trailheads and a network of paths allow for a variety of one-way or loop hikes of which the shortest is the 3.3 mile circuit along Echo Canyon, while another popular destination (Heart of Rocks) is reached by a one-way trip of 3.6 miles. But the best option, for an all day hike, is known as the Big Loop, a 9.5 mile trip to all parts of the formations. The loop comprises eight separate trails, passing right through several spectacular groups of pinnacles, and also encountering shady canyons, a stream with residual pools, and an open plateau where the views encompass many square miles of the surrounding mountains. The total elevation gain along the loop is 1,800 feet, and typical hiking times are between 4 and 6 hours. Like all of the Chiricahua Mountains, plant life is plentiful and varied, with cacti, yucca and other desert plants growing on exposed, south facing slopes, and numerous wildflowers and moisture-loving plants in the sheltered oak and pine woodland along the canyon floors. Big Loop topographic map, Chiricahua location map. 32 views along the trail; gallery, slideshow. The loop can begin from Massai Point, right at the end of Bonita Canyon Drive, and be done in either direction, though most people begin half a mile back at the Echo Canyon Trailhead and walk anticlockwise, since this is the quickest route to interesting scenery. 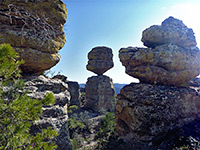 This location is high (6,780 feet) and overlooks much of the national monument, the majority of which is thickly wooded, but grey hoodoos rise above the trees in many places. There is one minor peak just north (7,301 foot Sugarloaf Mountain, reached by a 0.9 mile trail), and more distant summits several miles north and south. The path (initially the Echo Canyon Trail) is wide and well used, like all in the national monument. It sets off fairly level, through a mix of trees and pinnacles, which are colored green and sometimes orange by lichen; later the rocks predominate, forming many crevices and small fissures, mostly to the north, including one larger, cave-like area identified by a sign as the Grottoes. 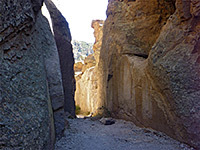 The trail moves to the north side of the ridge separating Echo Canyon and Rhyolite Canyon, for good views of the former, then starts to descend, via several shady, slot-like passageways between sheer-sided rocks - one is known as Wall Street. 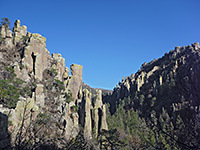 The land drops away more steeply as the pinnacles are replaced by earthen slopes, and the surroundings become wooded when the path reaches the floor of Echo Canyon, a flattish area with tall trees (Echo Park), most damaged by a recent wildfire. A seasonal stream flows through, creating pools and a few tiny cascades, but all dries up in summer. The streambed is followed for a short distance, until the canyon starts to drop away steeply, whereupon the path traverses along the south edge and rounds a corner to an overlook high above the junction with the larger Rhyolite Canyon. There are no trees here so the views are unrestricted, up and down both ravines and west towards the park entrance. A junction is reached soon after; straight ahead is the mostly level Hailstone Trail along the base of the pinnacles lining Rhyolite Canyon, part of the 3.3 mile Echo Canyon loop, but the Big Loop continues by turning right along the Upper Rhyolite Canyon Trail, which starts with a quick descent of an exposed hillside to the overgrown valley floor, filled with ferns, bushes, big trees and large boulders. The creek through this drainage dries up rather earlier in the season. The Hailstone Trail is short, just 0.8 miles, and it traverses bushy, quite exposed slopes, generally lacking the large trees found along the more sheltered north-facing slopes on the opposite side of the canyon. 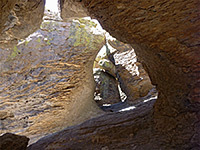 The volcanic formations are always close by, just north of the path, which stays around 150 feet above the valley floor. The trail crosses the streambed a few times, then starts a steady climb up the south side of the valley, soon becoming 200 feet above, and on to the second junction, where the Lower Rhyolite Canyon Trail continues descending towards the visitor center, while the Sarah Deming Trail branches eastwards, up a tributary canyon. This route gains height steadily, along the thickly wooded slopes south of the drainage, passing a few volcanic rocks at one point but otherwise only trees and bushes. The footpath crosses to the north side towards the upper end of the ravine then cuts back west, climbing a sunny slope to the third junction, at the start of the Heart of Rocks Loop. There are plenty of volcanic rocks in view now, close by and ahead to the north, where the trail proceeds, first dropping down a way into a shady glen where it arrives at another junction, at the start of the loop section. Clockwise is the suggested direction as the views are better; after climbing quite steeply through more woodland, the trees fade away and the path encounters just rocks for the next half mile. A few of the formations have an official name, indicated by a sign, such as Duck on a Rock, Thor's Hammer, Camel Head and Punch and Judy. The best vista is about half way along the loop, to the north, looking over Rhyolite and Echo canyons, towards Sugarloaf Mountain - here thousands of pinnacles are in view. The east side of the Heart of Rocks Loop descends more gradually, and follows a small ravine back to the start, as the trees return. The Big Loop continues eastwards along the Big Balanced Rock Trail, initially across a level area past more large boulders including the eponymous delicately poised hoodoo. 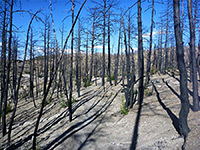 After here, the land rises gradually and becomes rather featureless, covered by sparse woodland and manzanita, severely burnt in a 2011 fire. The views are of higher, grey mountains to the south, and lesser hills ahead. The path descends into a dell and reaches the next junction, with the half mile (spur) Inspiration Point Trail, which passes similar woodland and then rockier ground, ending at a fine overlook atop a group of rocks high above the upper reaches of Rhyolite Canyon. The views, best in the morning or the middle of the day, are not quite as good as in the Heart of Rocks, though the point is somewhat closer to the formations on the far side of the valley. Back at the junction, the path (now the Mushroom Rock Trail) drops into another drainage, Hunt Canyon, and leads right along the dry streambed for a while before traversing through tall woodland on the north side, as the ravine deepens. Above is the small eroded formation of Mushroom Rock, poking out of the tree tops, but not very spectacular. After meeting Rhyolite Canyon and crossing another small tributary, the next junction is at the east end of the Hailstone Trail from Echo Canyon, and also with the 0.7 mile Ed Riggs Trail, the eighth and final component of the Big Loop. This leads up another wooded canyon, steadily becoming shallower, to a junction with a nature trail from Massai Point and back to the Echo Canyon trailhead.